With yellow and light purple Allamandas providing a colorful backdrop, this Bird of Paradise appears to proudly peruse our Grand Terrace. 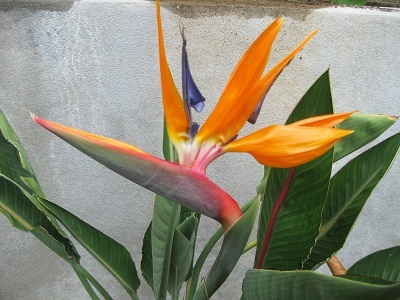 “Flamboyant” has been used to describe the Bird of Paradise. Native to the southern and eastern parts of the Cape Province and northern Natal in South Africa, I can think a no more apt a name than that! Its showy flower resembles the head of an exotic bird with an orange crest on a head and bill of blue. It is the quintessential floral essence of the tropics! Its stunning bloom is magnificent whether in the wild, poolside (a good location as it is virtually litter free), in a terrace pot – but don’t let them become root bound, orchestrated as a landscape plant, or merely enjoyed inside as part of a cut floral arrangement. It received its common name after the colorful New Guinea bird and its Latin name was in honor of Charlotte of Merklenberg-Strelitz who was the German queen of King George III of Great Britain and who lived at the Kew Botanical Gardens for several years. Perhaps the best known of the four different Strelitzia varieties is this one – the orange and blue flowered S. reginae that grows to around a meter in height. 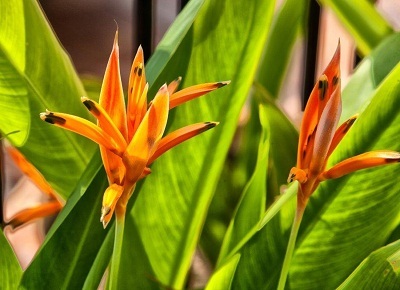 Strelitzia reginae plants consist of clumps of greyish-green leaves, with long stalks and broad oval blades, arising from an underground stem (rhizome). The blue and white Giant Bird of Paradise – S. nicolai – looms up to several meters. The S. reginae grows in a spiral arrangement, hence differentiating it from the large Traveler’s Palm (which isn’t a palm at all) with its two-foot (61 cm) in diameter white-brown flowers! If ever there was a “Look at me” tropical flower, the Bird of Paradise is it! This slow grower is in the trunkless Strelitzia plant genus, along with the magnificent array of Heliconia varieties, the Traveler’s Palm and wild bananas. You can see the family resemblance as its foliage resembles small banana leaves with long petioles. Its stiff and leathery, paddle-shaped leaves are arranged in two ranks to form a fan-like crown of thick, waxy, glossy-green foliage. These leaf blades are around six inches wide and eighteen inches long. Emerging from a stout spathe, the bi-sexual flowering structure is borne atop long scapes (stems growing from the crown of the roots) that grow to five feet (1.5 meters) or more, looming high to show off the radiance of its blooms. It is comprised of a series of highly-colored bracts that are formed into green, red, and or purplish canoe-like structures. Depending upon the age and size of the plant these may vary anywhere between four to eight inches long (10-20 cm). 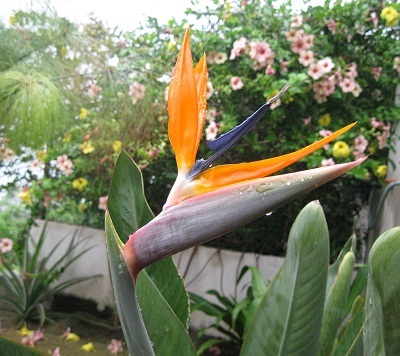 Each Bird of Paradise flower has three upright orange sepals and three vivid blue petals. Two of the petals are joined together in a structure resembling an arrowhead with the third petal forming a nectary (“Yum” say the birds!) at the base of the flower. Each bract contains two or more protruding florets of bright yellow or orange elongated petals and a bright blue tongue. The female part of the Birds of Paradise flower is the long extension of the blue tongue, which is extended well away from the stamens. (Whew! Now that’s probably way more than you’ll ever need – or want – to know about the intricacies of this plant but I felt a compulsion to share it!) With a moderate tolerance for wind, salt and drought, the blooms occur best in mostly full sun (though they like a bit of shade from the hottest afternoon sun), planted in rich moist soil – but let it dry out between waterings. (In the hotter climes, the leaves stay nicer in partial shade) When a pollinator comes searching for nectar, the anthers are levered clear of the flower and deposit pollen on the breast of the bird so when it flies to another plant, this pollen is transferred to the stigma of the new flower – ingenious, that! The resulting fruit is a leathery capsule containing numerous small seeds with a red aril (exterior covering) at the base – possibly also to attract birds. This variety of Heliconia is mistaken by some folks as a Bird of Paradise. It is not, but they are in the same family! Plant them in good peat-based, organically rich, potting soil. Feed your Birds of Paradise every other week during spring and summer with a liquid Plant Food or a water-soluble fertilizer. After they’ve bloomed for a year or two you can carefully divide them, but remember, this will preclude your plant from flowering again for several years. You can also propagate them by seeds – but soak them before planting. Every tropical garden should have at least one!